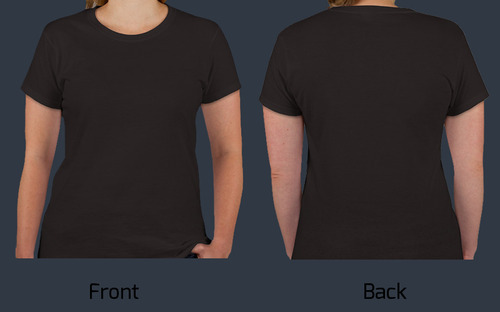 With rich industry experience and knowledge, we are engaged in offering an exclusive range of Women’s Premium T shirt. Our skilled professionals follow the latest fashion trends, while designing these t-shirts. Offered t-shirts can be paired with jeans, capri or shorts widely demanded in the market. These t-shirts are available in beautiful colors and designs to meet the specific requirements of our valued clients. We've created the perfect t-shirt for you - part of the all new Kottonhood Collection. This all rounder has been optimized for our print-on-demand technology, and it always provides brilliant results. Colors and sizes of the new collection for women, men and kids are exactly the same as before, so that you can suit up your family, club or team in consistent matching colors. Fairly produced, with pure cotton and a fabric weight of 160-170grams. Established in the year 2013, at Mumbai (Maharashtra, India), we, “Kottonhood Fashion Private Limited,” are counted as the leading manufacturer, exporter, trader and supplier of a wide range of Men’s T-Shirts, Designer Hoodies, Long Sleeve T-Shirts & Sweatshirts, Polo Shirts, Pants & Shorts, Long Sleeve Shirts, Eco Friendly T-Shirts, Women T-Shirts, Women’s Long Sleeve Shirts, Women’s Hoodies, Women’s Polo and Women’s Eco-friendly T Shirt. Our skilled team of designers manufactures these products utilizing optimum quality raw material, obtained from the well-established vendors of the market. These products are extensively demanded and appraised by our cherished customers, owing to the features like shrink resistant, easy to wash, colorfastness, attractive look, low maintenance high strength and long lasting sheen. We design these products in complete compliance with the set international quality standards in our sophisticated manufacturing unit. Further, our precious clients can avail these products in various specifications as per their specific requirements and at highly competitive prices.